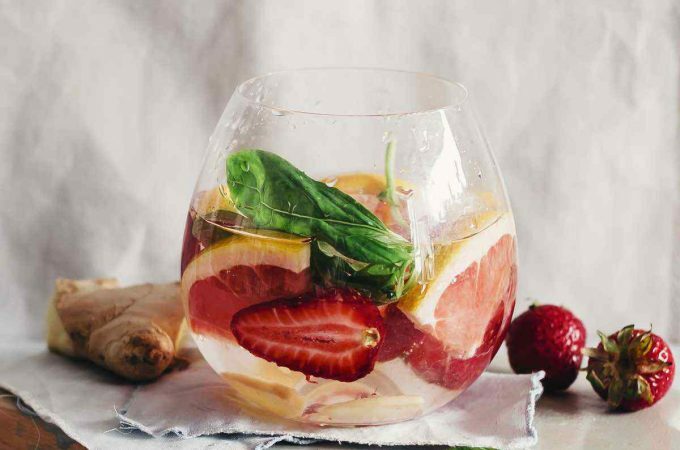 A good detox smoothie recipe should include a mix of fresh fruits and vegetables that fight inflammation and toxins while nourishing and rebuilding any damaged tissues or organs. Herbs, spices, nuts, and seeds are also great for keeping you fuller longer as well as for providing necessary omega fatty acids. 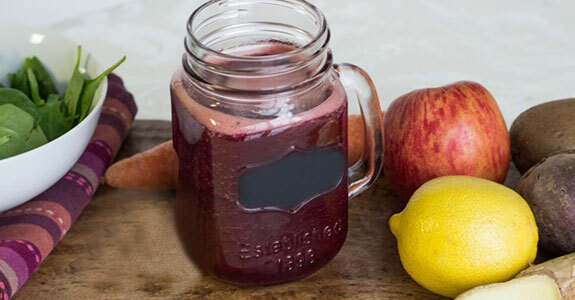 This ABC smoothie stands for apple, beet, and carrot. It also contains cucumber and ginger, which is great for aiding in digestion, upset stomach, and of course, a delicious taste. Beets are one of the best vegetables to detox the kidneys and liver with. They also have a naturally sweet taste that’s perfect for a no-sugar added smoothie. 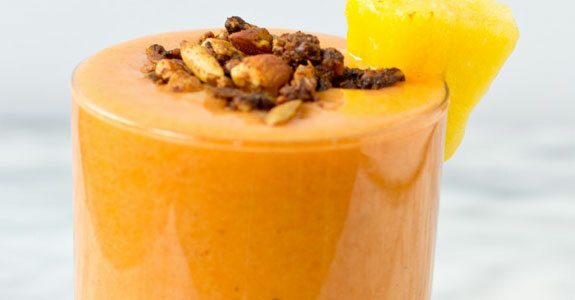 This recipe packs in a great deal of variety into one little smoothie. 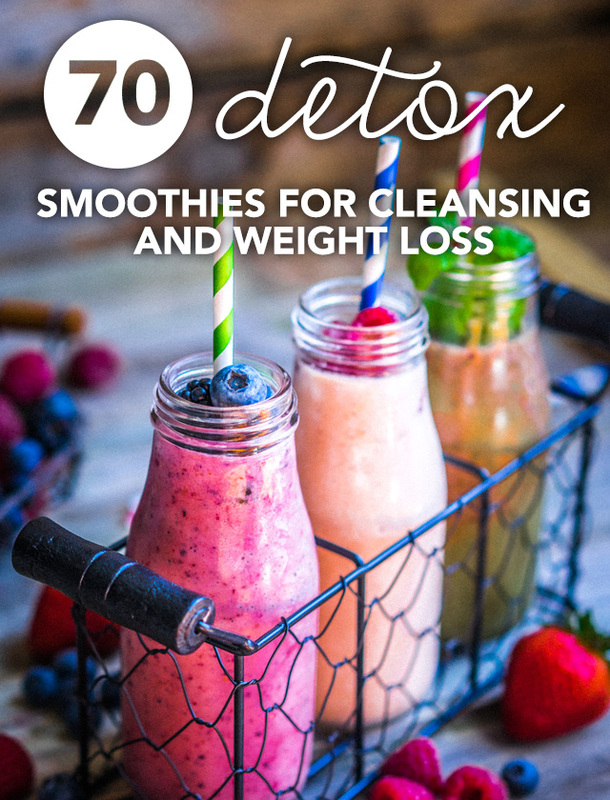 Ingredients include beets, beet greens, cranberries, peaches, cucumber, avocado, lime, a banana, and blueberries. Cranberries are especially great for supporting the urinary tract and preventing urinary tract infections by blocking bad bacteria from binding to the lining of the urinary tract. Ingredients in this all-star detox smoothie include kale, spinach, lemon, a green apple and cucumber. It’s high in vitamins A, C, and K, iron and calcium. Lemon is great for detoxifying the blood, which takes some of the work load off the kidneys and liver to get rid of toxins. 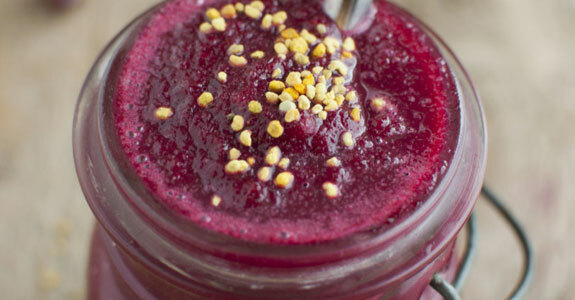 This smoothie is also naturally sweet so you won’t need the added honey! Berries contain a special phytochemical known as anthocyanin, which is a pigment usually found in the skin of fruits or vegetables that give it color. Research shows that anthocyanin may work as an antioxidant to reduce cancer cells from spreading as well as inhibit the formation of tumors. 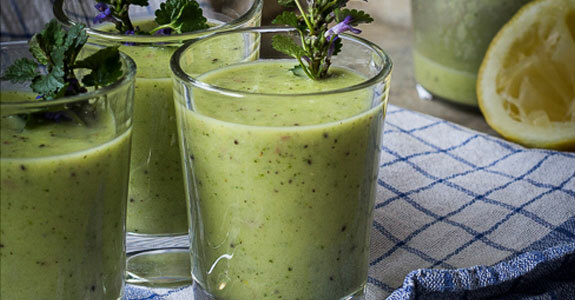 Herbs are the secret ingredient in this smoothie. Cilantro may help remove heavy toxins from the body as well as lower cholesterol levels. Turmeric has incredible anti-inflammatory properties that have been shown to be as effective as many over the counter medications. Turmeric may also help prevent cancer and reduce pain. This smoothie helps you fight that awful bloated feeling (and its symptoms). It’s full of anti-inflammatory ingredients such as romaine lettuce, cucumber, coconut water, ginger, lime, and mint. Mint does an excellent job of stimulating the digestion system, which helps make the digestive process more efficient (thus decreasing the opportunity for bloating). What’s the best way to start each morning? 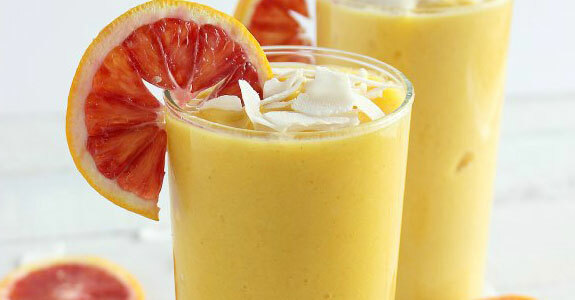 By nourishing yourself with this delicious, sugar-free smoothie. It includes mango, banana, pineapple, raspberries, coconut water, and lemon. Pineapple contains a compound known as bromelain that is especially excellent for reducing inflammation in the gut. Coconut water is full of electrolytes, which makes it a great choice for starting your day properly hydrated. Cilantro and parsley are two life-changing herbs that should be included in your daily diet. Cilantro is high in calcium, potassium, magnesium, and iron, which is needed for supporting red blood cell production. Parsley is a diuretic that may be able to help flush toxins through the urinary tract. Cilantro and parsley also have wonderful anti-inflammatory properties. Mangoes and pineapples are a powerful anti-inflammatory duo that supports the digestive system, which is needed for efficient nutrient absorption, detoxification purposes, and for metabolism support. Pineapple is high in the trace mineral manganese, which is important for energy production and antioxidant defenses. It is also high in the B vitamin thiamine that is also needed for energy production. This detox smoothie recipe may help with improving digestion, soothing an upset stomach, promoting flexibility, and supporting male fertility. It’s high in vitamin C, which acts like an antioxidant in the body to neutralize free radicals and prevent the onset of chronic diseases. Cherries are also high in melatonin, which may be able to help promote sleep. Green vegetables such as kale are a great source of chlorophyll, the pigment that gives green vegetables their spectacular color. Chlorophyll eliminates toxins in the body by acting as a diuretic. It also helps alkalize the body by providing oxygen to tissues via the blood, which helps eliminates toxins through the process of respiration. 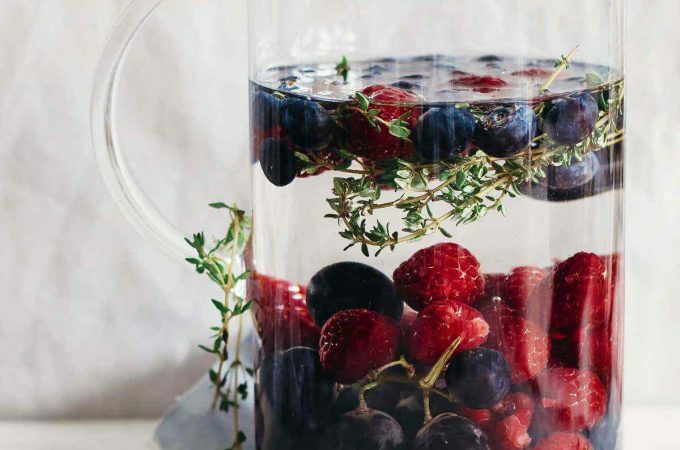 If you could pick only two ingredients to detox with, berries and kale should be it. Kale is great at binding to bile acids in the digestive tract in order to move them out of the body quickly. They are also a great source of vitamins A and K. Berries have a great taste all by themselves, so there’s no need for the added stevia! Blueberries are a low-glycemic and naturally delicious way to boost your memory. They contain a unique blend of phytonutrients that may also support the cardiovascular system, balance blood sugar levels, promote eye health, and prevent cancer. Chia seeds are a great addition to this recipe as they are a great source of omega 3 fatty acids. Wild herbs are a great addition to your detox smoothie as they are grown the way natural intended them (without pesticides). But a word of caution- not all herbs are safe to eat. The author suggests using dandelion, ashweed, and ground ivy, which are commonly found in parks and wooded areas. Beets may be able to support the heart, liver, and large intestine. It may also be able to support blood circulation. Beets are high in boron as well as betacyanin, a potent anticarcinogen that gives beets its great color. They are also anti-inflammatory and may be able to treat anemia and purify the blood. This recipe calls for half of an avocado and two bananas for a deliciously rich and creamy texture. Avocados are also high in monosaturated fats, which may support a healthy heart. They are also high in vitamins E and K, fiber, potassium, and magnesium. Avocados are high in anti-inflammatory flavonols such as catechins and procyanidins. Cherries are a blood tonic and may help promote circulation of the blood. They help remove toxins and support a healthy spleen, stomach, heart, ling, liver, and kidneys. Cherries are high in vitamin C and contain lutein, which may help support vision. They are also a good source of antioxidants and anti-inflammatory properties. 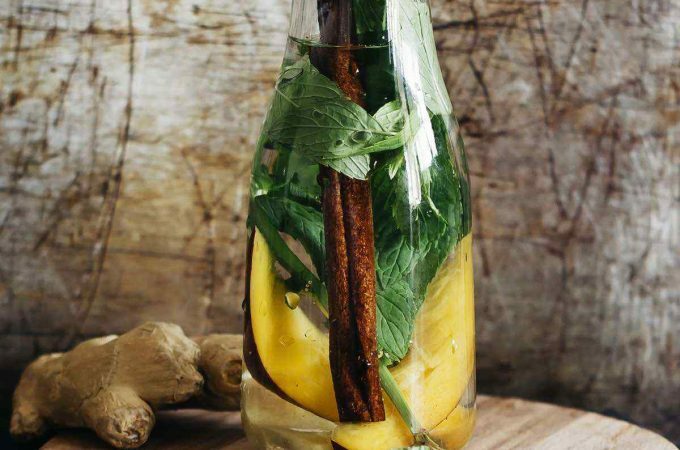 This refreshing detox smoothie includes turmeric, an Indian herb that is one of the best sources of beta-carotene. It is a potent antioxidant that has anti-inflammatory, antibacterial, antiarthritic, and anticancer properties. Turmeric may also reduce pain and control blood sugar levels in diabetics. 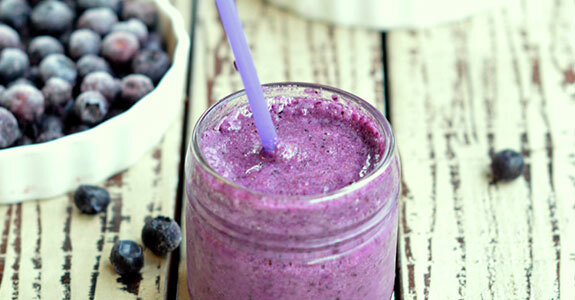 This deliciously simply smoothie has two main ingredients: pears and blueberries. Pears are a good source of fiber, boron, and the electrolyte potassium. They also contain pectin, which may help cleanse the body of toxins. Blueberries are high in antioxidants as well as anti-inflammatory benefits. They may also help reduce the appearance of aging. 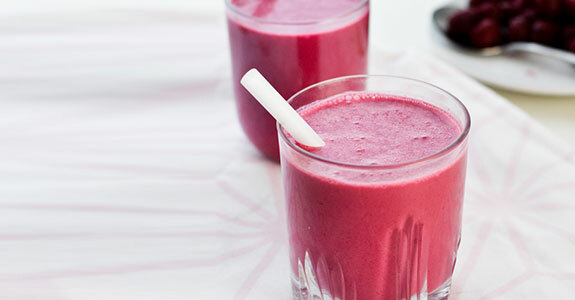 This detox smoothie is so hearty that it would also make a great breakfast or mid-day snack. Ingredients include kale, dates, an apple, a carrot, lemon juice, almond butter and almond milk. Dates are naturally sweet and satisfying, so you won’t need the added stevia. They also have astringing tannins that help cleanse the large intestine and promote regularity. This smoothie deserves to be enjoyed year round. Chia seeds are a great source of omega 3 fatty acids, which may help raise HDL (good) cholesterol. They are also high in calcium, magnesium, iron, zinc, and antioxidants. Chia seed consumption may also help reduce the risk of certain diseases such as obesity, heart disease, and diabetes. This smoothie recipe is sure to get you back on track after indulging in all those holiday treats. It calls for kale, cranberries, strawberries, and apple juice. If using a fruit juice, be sure to use one that raw and unprocessed as many juices are heat treated, which kills precious nutrients. Or better yet, forgo the fruit juice and just use water. This recipe calls for rainbow chard, which isn’t only pretty to look at; it’s great for your health. Chard belongs to the beet family and is a great source of phytonutrients. It is high in antioxidants and anti-inflammatory benefits. Chard may also be able to reduce blood sugar levels and support a healthy skeletal system. Papaya is a great fruit to detox with. It’s tasty, healthy, and blends well with other foods. Papaya is considered to be helpful in easing stomach ulcers as well as rheumatism due to its anti-inflammatory properties. It may also support healthy vision as well as help with the prevention of cancer. Pumpkin seeds aren’t a food you would normally think to put in a smoothie, but here’s why it’s a great idea. Pumpkin seeds are an excellent source of vitamin E, which may act like an antioxidant in the body to neutralize free radicals and eliminate toxins. Pumpkin seeds may also have anti-viral, anti-fungal, and anti-microbial benefits. 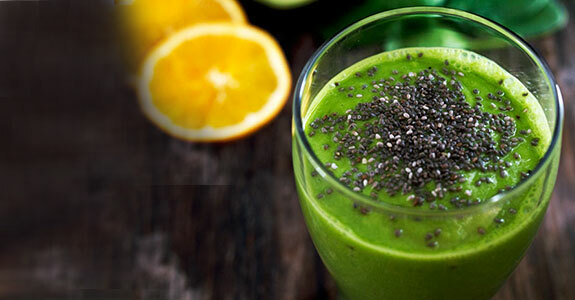 This smoothie recipe calls for spirulina, which is an incredibly healthy and unique algae. Spirulia benefits include antioxidant, anti-bacterial, antiviral, anticancer, anti-inflammatory, anti-allergic, and anti-diabetic. It is a great source of vegetarian protein and also promotes a healthy gut that is needed in order to maintain a healthy immune system. 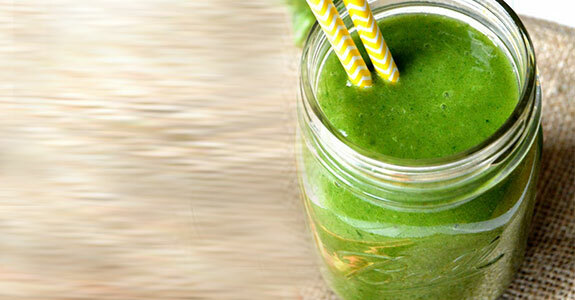 This smoothie recipe is packed with green goodness from kale, cucumber, spinach, and a green apple. Green leafy vegetables such as spinach and kale are high in vitamins A and K as well as anti-inflammatory benefits that remove toxins and uncomfortable stomach bloating. Because this recipe is naturally sweet you won’t need that agave! Broccoli is most definitely a superfood. It reduces inflammation in the body as well as helps support the liver, stomach, and bladder. Broccoli also has anticancer, antifungal, antiviral, and antibacterial benefits. It is high in vitamins A and K and supplies twice the amount of vitamin C as an orange. This terrific detox smoothie includes all the all star ingredients, including kale, spinach, an orange, and a banana. Spinach goes great in smoothie because it blends up nicely. It high in iron, calcium, vitamins C and K, carotenes, and folic acid, and it supports large intestine, stomach, and liver functions. Mint is a delicious addition to any dish. It has been used to treat inflammation, migraine headaches, nausea, fevers, intestinal gas and bloating, liver disorders, and indigestion. Mint is also a stimulant, which may give you a natural burst of energy. It is also a diuretic that may provide additional detoxifying benefits. 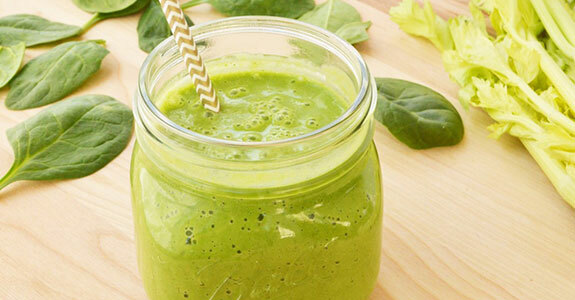 This smoothie recipe includes all the basics you need for a natural detox, including mango, baby spinach, and a banana. For a true detox (and for a fresher taste) try using your own homemade almond milk in this recipe in order to avoid the additive carrageen, which is often added to store bought nut milk. Carrageen causes digestive distress by binding to the digestive tract and preventing it from doing its job. If you’re looking for a detox smoothie that tastes like a milkshake, you’ve found it. This recipe includes walnuts, which are a great source of omega 3 fatty acids and vitamin E. Benefits of walnuts include reducing inflammation, improving blood quality, decreasing the risk of excess blood clots, and improving cell function. 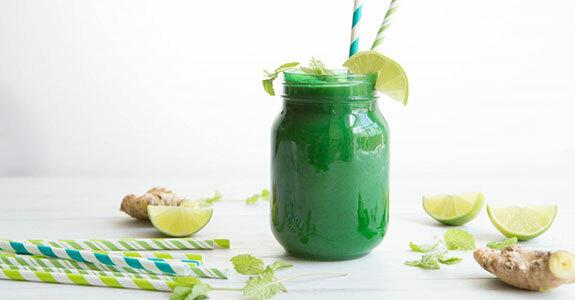 Because the ingredients in this superfood smoothie include spinach, broccoli, spirulina, mint, parsley, ginger, a banana, lemon juice, andapple, it’s hard to highlight one ingredient! 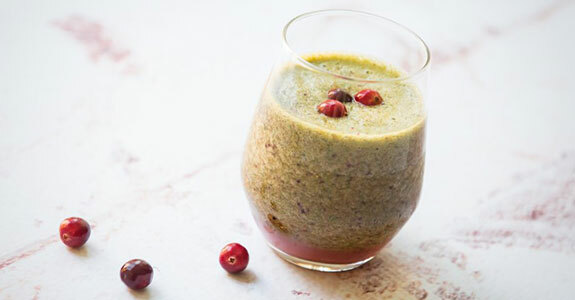 Together, this smoothie is packed with nutrients that reduce inflammation, boost the immune system, lower blood sugar levels, increase energy, and remove toxins. Oranges are known for being high in vitamin C, which helps boost the immune system by acting like an antioxidant. Oranges are also great for aiding in digestion and reducing intestinal gas. They also help cleanse the blood and liver, making them a great ingredient to add to a detox smoothie. Pineapple contains an anti-inflammatory enzyme known as bromelain, which helps aid in the digestion of protein and starchy carbohydrates. Bromelain eliminates diseased cells in the bronchial tissues, making it a great natural remedy for bronchitis. Bromelain may also be able to get rid of intestinal parasites. Figs are a crunchy dried fruit with intense sweetness. They are great for increasing energy as well as cleansing and soothing the digestive system. They are also one of the few fruits that provide omega 3 fatty acids, which helps absorb the fat soluble vitamins A, D, E, and K. Because they have a high sugar content, you won’t need the added agave that this recipe calls for. Chia seeds provide a good source of omega 3 fatty acids and fiber to help keep you full longer. This recipe calls for a wonderful blend of strawberries, blackberries, and raspberries, which are high in phytonutrients that reduce inflammation, boost the immune system, and make it hard for chronic diseases to thrive in the body. Cherries have been credited with being a remedy for pain. They are an excellent source of antioxidants with anti-inflammatory compounds known as anthocyanins. Beets are also great for supporting Phase II of the detoxification process. Try swapping out the rice milk for nut milk to keep it as clean as possible. Kale is high in vitamins A, C and K, chlorophyll, calcium, and beta-carotene. Specifically, it is used for treating ulcers in the stomach and small intestine. It has anti-inflammatory and anticancer properties. Kale also contains lutein, which may be able to help prevent macular degeneration in the eyes. Ingredients in this simple yet delicious recipe include cucumber, dates, lemon, and chopped pineapple. 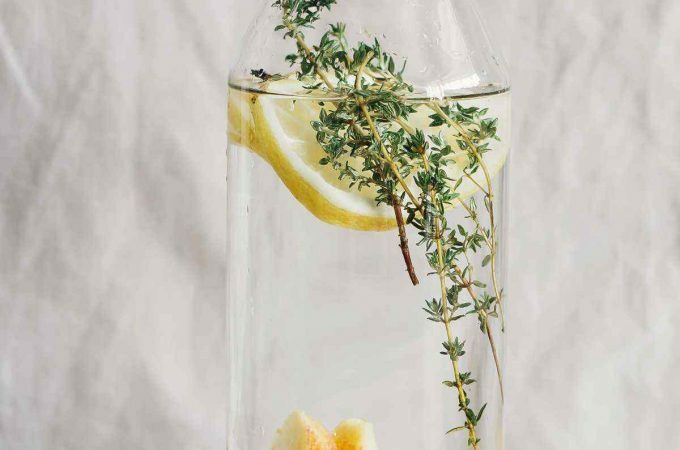 Lemon is especially great for detoxifying the blood, which takes some of the pressure off the liver and kidneys from being solely responsible for removing toxins. Dates provide a great source of fiber and a delicious natural sweetness. 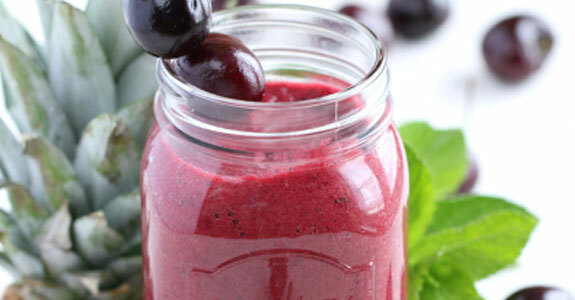 This diverse smoothie recipe has all the ingredients you need for a food based protein fix. It includes hemp seeds, chia seeds, almond milk, spinach, kale, and coconut water, just to name a few. Aside from omega 3 fatty acids, hemp seeds are a good source of calcium, iron, magnesium, manganese, zinc, potassium, and phosphorus. Nutmeg may only be one spice but its health benefits are many. It may be able to reduce the symptoms of the common cold, such as coughing, aid in digestion, and reduce intestinal gas. Nutmeg contains methanol, which may be able to help reduce pain. It also provides a warming and pleasant taste. This smoothie recipe combines the healing power of spinach or kale, blueberries, and chia seeds. Chia seeds are high in omega 3 fatty acids, which help reduce inflammation, promote brain health, and support cellular function. Omega 3 fatty acids also help keep your skin healthy and are great for keeping you full until it’s time for the next meal. Swiss chard is a great source of vitamins A, C, and K. They may be able to help regulate blood sugar levels, support bone health, and provide antioxidant and anti-inflammatory benefits. For a truly toxin-eliminating smoothie, try swapping the rice milk for nut milk or water if you’re allergic. Beets are a great source of vitamins A and K, as well as folic acid and boron. They may be able to treat constipation, promote menstruation, and detox the liver through the Phase II detoxification process. Beets are anti-inflammatory and may also be able to remove toxins from the blood and kidneys. There are not many health problems that kale, beets, and carrots cannot handle. They are packed with anti-inflammatory, immune-boosting, and toxin-removing compounds. This recipe also calls for the sweetness of kiwi and apples for an added boost of the antioxidant vitamin C as well as blood sugar reducing benefits. Tired of drinking smoothies that taste like a vegetable? This recipe will help you shake things up a bit. It includes strawberries, mango, pineapple, banana, and spinach, all of which are packed with immune-boosting and toxin-removing phytonutrients. Be sure to use non-dairy milk and omit the vanilla as you won’t need any additional sweetness. 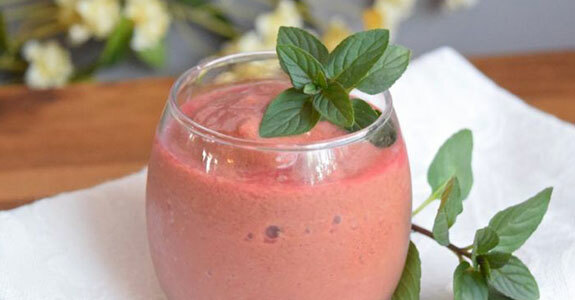 The only thing better about this smoothie’s delicious looking color is its delicious taste. It calls for kale, blueberries, bananas, acai, hemp seeds, and pomegranate seeds. Hemp seeds support the kidneys and are a great source of easily digestible vegetarian protein. It is also a good source of iron, zinc, copper, phosphorus, manganese, and magnesium. 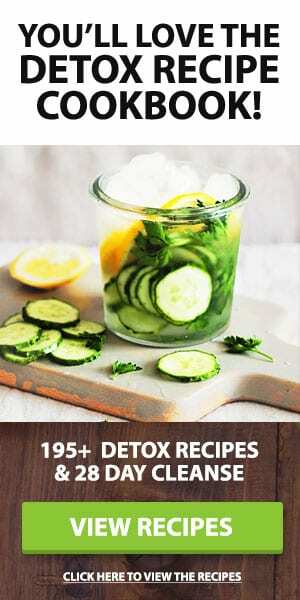 This recipe calls for a variety of great detoxifying foods, including spinach, kale, apple, celery, chia or flax seeds, mango, carrot, pineapple, and lemon, just to name a few. Other ingredients include turmeric, cinnamon, and ginger. Not only does cinnamon taste great, it may also be able to reduce intestinal gas. Grapefruit cleanses the liver and kidneys as well as reduces cholesterol and promotes digestive health by easing constipation. It is a great source of vitamin C, which acts as an antioxidant in the body to remove toxins and boost the immune system. Grapefruits may also be used to treat migraines and depression. Can certain foods make you beautiful? You bet they can! Research shows that eating a diet high in fruits and vegetables gives your skin a healthy glow. Blueberries are especially high in unique flavonoids known as anthocyanins, which act as antioxidants to protect, heal, and restore health. This mean smoothie gets its wickedly green color from spirulina powder, a type of bacteria that is known as blue-green algae. Spirulina is a great source of vegetarian protein as well as several B vitamins, copper, and iron. It also has potent antioxidant and anti-inflammatory benefits that eliminate toxins from tissues and organs. Cucumbers are a great addition to any detox smoothie because they support the urinary tract, the large intestine, and the lungs. 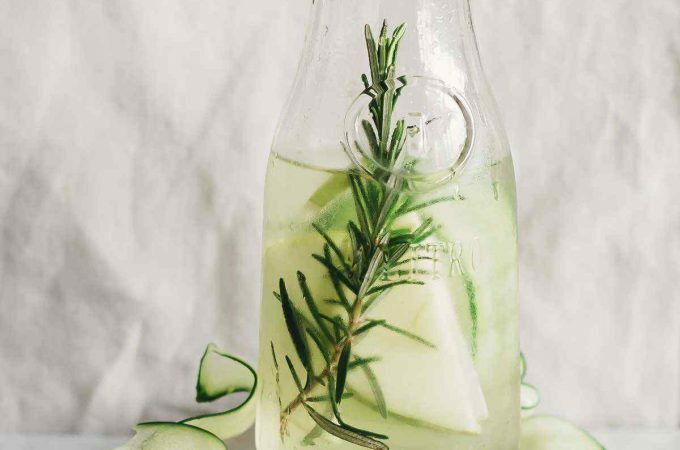 Cucumbers are largely made up of water (90 percent) so they are great at hydrating throughout your detox, which is an important part of removing toxins. Flaxseeds are the number one source of a phytonutrient called lignans, which are high in antioxidant and fiber-like benefits. Other benefits of flaxseeds include anti-inflammatory as well as cardiovascular and Phase II detoxification support. Due to their unique antioxidant benefits, they may also be able to reduce the risk of cancer. Red cabbage is known for its ability to fight cancer due to its high antioxidant content, its anti-inflammatory properties, and its high content of glucosinolates. Add vitamin C to the list of antioxidants in red cabbage. Other benefits of red cabbage include digestive and cardiovascular support. 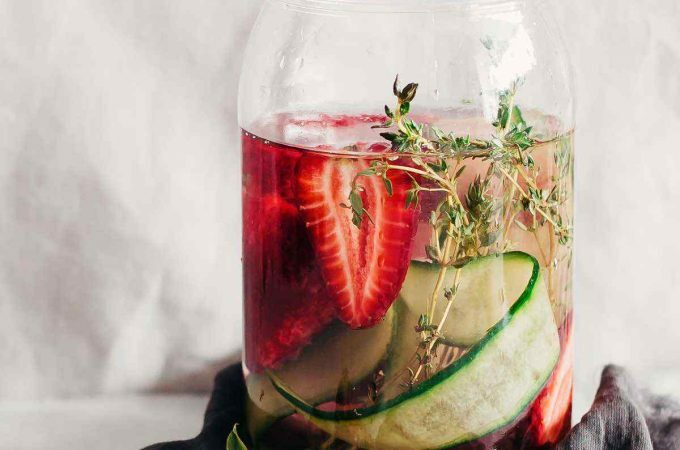 This simple detox recipe has everything you need to get rid of toxins and stock up on antioxidant power. It includes pineapple, banana, spinach, kale, and chia seeds. Pineapple contains an enzyme known as bromelain that is especially good for reducing inflammation in the gut as well as in rheumatism. Cranberries are known for their wonderful healing powers by preventing bacteria from binding to the urinary tract, thus resulting in a UTI. They are also a good source of polyphenol antioxidants that benefit the immune and cardiovascular systems. Cranberries may also be effective in the prevention of cancer as well as tooth decay. Raspberries and blackberries are not only delicious; they are also high in antioxidants and anti-inflammatory properties. Raspberries have been shown to reduce inflammation and the reproduction of cancer cells in breast, colon, prostate, cervical, and esophageal cancers. They may also be able to stabilize blood sugar levels. 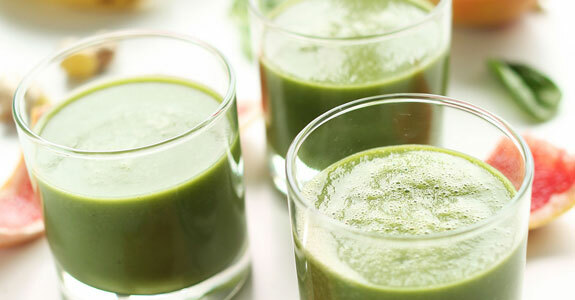 The apple, mango and banana in this recipe make for a delicious sweet treat while the kale provides additional vitamins, minerals, and phytonutrients that help eliminate toxins and restore health. Eating leafy green vegetables has been shown to be beneficial in the prevention of chronic disorders, stabilizing blood sugar levels, improving cognitive functions, and boost the immune system. Kale aids in lung congestion, making it a good detox food when trying to purge a cold. It also benefits the stomach and is known to be a specific healer of the liver and immune system. The juice of kale is best used for treating ulcers in the stomach and small intestine, which makes this a must-have food for anyone suffering from Ulcerative Colitis or stomach ulcers. Cranberries are your kidneys’ best friend. They are a good source of polyphenol antioxidants that support the cardiovascular and immune systems. Cranberries also contain tannins, which prevents bad bacteria from binding to the bladder, teeth, and urinary tract. They also prevent the formation of kidney stones. This recipe is a perfect example of why you shouldn’t judge a book by its cover. Underneath a dark color is a variety of health benefits from ingredients such as flaxseed, blueberries, banana, spinach, and almond milk that are great for removing toxins, eliminating inflammation and bloating, and restoring proper pH levels. Arugula has a wonderful peppery flavor that will liven up almost any dish (or drink). It is known for being a digestive tonic. Arugula contains glucosinolates, a type of antioxidant that has been show to prevent cancer. It is also high in vitamins A and C, calcium, folic acid, iron, copper, riboflavin, and potassium. This detox smoothie has such an incredible color that it warms you up just by looking at it! 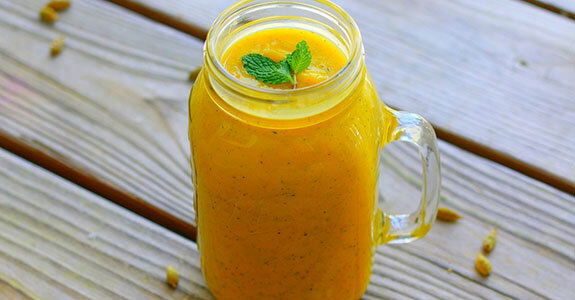 Turmeric, carrots, peaches and ginger give it a deep orange color with tons of detox benefits. Peaches act as a cleanser for the bladder and kidneys. They also stimulate digestion and support skin health. If this smoothie recipe doesn’t make you feel like a kid again, nothing will. It tastes just like the PB&J you used to eat as a kid, sans the sugar high. Ingredients include dates, peanut butter, a banana, strawberries, and nut milk. Strawberries are an excellent source of vitamin C, which helps remove toxins from the body and strengthen the immune system. If the color of this smoothie is any indication of how it will make you feel, consider yourself vibrant. 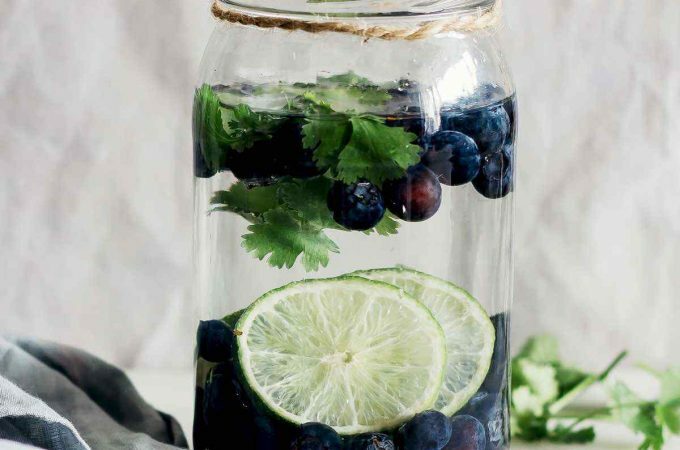 The recipe contains just three ingredients, including red cabbage, blueberries, and water (or fluid of your choice). Blueberries are a great source of anthocyanidin compounds, which act as antioxidants in the body to prevent deterioration of cells from aging, disease, free radicals, toxins, and other harmful disruptions. 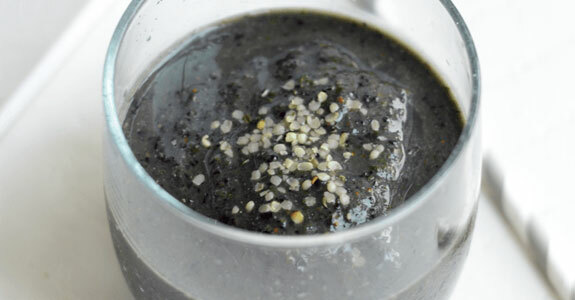 This recipe calls for kombu, otherwise known as the “King of Seaweed” by some. It may be able to strengthen the nervous system and kidneys as well as reduce masses in the body (such as tumors). Kombu is high in vitamins A and C, potassium, calcium, B vitamins, and iodine. 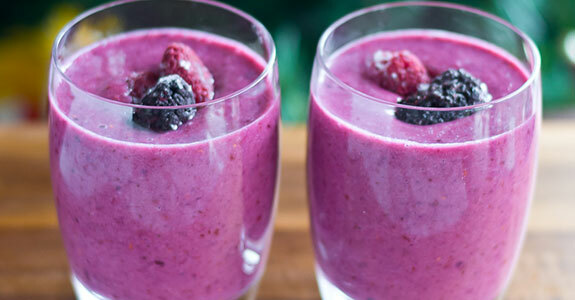 This smoothie recipe is as easy to make as they come. But that doesn’t mean it’s not packed with everything you need to detox. Beets may be able to treat anemia and constipation, cleanse the liver, and purify the blood. They may also be able to prevent acid crystals from forming into kidney stones. Shedding a few pounds is just one of the benefits of a detox. This recipe is delicious and easy to drink. It includes pineapple, which contains an anti-inflammatory enzyme known as bromelain that helps break down starches and protein. Bromelain is also excellent in aiding digestive health by reducing intestinal gas and bloating. Celery is a well known blood cleanser that also supports stomach, liver, kidney, and bladder health. It contains a compound known as coumarin, which help reduce blood pressure levels and may be used to treat migraines. Coumarin may also be used as an anticancer agent. Celery is also a diuretic, which helps moves toxins along the urinary tract.